That wonderful American outdoors writer Negley Farson had it right; fishing’s greatest reward is where it takes us. Anglers everywhere will know what he meant – those days when, mid-cast, we say to ourselves, “most of the people I know are at work right now” and we pause just long enough to scan the water and the mountains around us, acknowledge the fact and chuckle to ourselves. I felt it often during the years I spent fishing the lochs of the Scottish Highlands, and I experienced it as recently as last week when I crunched along an icy, deserted River Thames towpath at dawn to a slack full of perch and pike. There have been many such places in my fishing life; haunted carp lakes, mist-shrouded tench pools, trout streams that have suddenly come to life with the concentric ripples of rising brownies – all magical, and for reasons that went beyond mere fishiness. But in almost forty years of fishing, I never felt Farson’s words as strongly as I did when I spent a week on the Corrib. I was there not just to fish, but to write the final chapters of a story. I was close to finishing a book about my thirteen-year pursuit of the large, predatory salmo ferox – and I needed to catch a big one. My adventures had taken me all over the Highlands of Scotland, to the wildest corners of Wales and the Lake District and, just the once, to a windswept Lough Derg with a bad-tempered girlfriend and a drunken ghillie, but in all that time I had failed to catch one over ten pounds in weight. 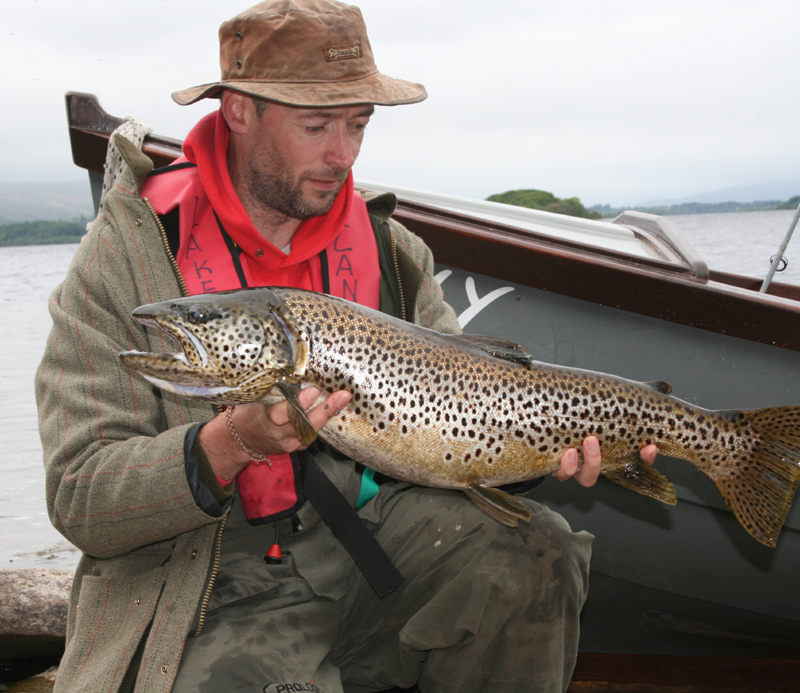 If my story was to end appropriately –and, with fishing stories, that means either disaster or the capture of a monster – then I knew it would have to take place on the Corrib, where the finest ferox trout of them all are to be found. To that end, I booked a room at Lal Faherty’s place in Oughterard and secured the services of one of the Corrib’s finest ghillies – the legendary Patrick Molloy. We had five days in early June in which to catch a fish and, if we did, I would have an end to my story. Three weeks before Vic and I were due to arrive, Patrick called. A twenty-five pounder, the largest in a century, had just been caught. The fortunate (and no doubt slightly bewildered) angler was a visitor from Europe who, but for a cloud of volcanic ash, should have been in another country at the time. “You’ll get your fish too, Jon”, Patrick assured me. “As long as it’s calm”. I didn’t dare dream of twenty-five pounders. My secret, undeclared hope was for a ten-pounder, but in reality I knew I’d be glad to catch any ferox at all. 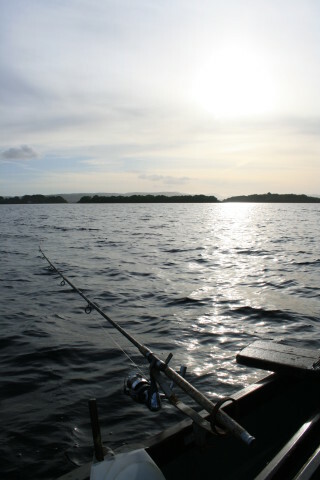 They are rare beasts, each one an ice-age survivor with looks to break the heart of any fisherman, and I knew from bitter experience that days of trolling could pass without a take – even on the magical waters of the Corrib. But Patrick was confident, and we had the one thing upon which all fishermen survive – pure, unrelenting hope. Patrick met us by Lal’s jetty on that first morning. The water had a certain choppiness about it and he advised that we take a fly rod with us too, but my single-mindedness won the day. We would be trolling the deeps between Inchiquin and Inishdoorus with roach baits fished a hundred yards behind us, and it would be salmo ferox or nothing. As we motored out to the islands the chop increased, I suspected it would be the latter. I needn’t have worried. Patrick had all the skills required of a ghillie – endless confidence, an inexhaustible supply of blarney and, most important of all, the kind of watercraft that can only be accumulated by a lifetime on a lough. It took him less than three hours to find the ferox trout, and by mid-afternoon we had netted a brace – both a lot bigger than ten pounds. The first day grew darker and colder and we eventually pulled up for shore coffee on one of the lough’s three-hundred and sixty-five islands late in the afternoon. Patrick busied himself with the Kelly Kettle and I tidied the boat and tackle, but we were both smart enough to sit still and look out at the water for a few moments, mugs in hand, and toast our success. My story now had its triumphant end. I wasn’t to know it then, but it was the beginning of the best week’s fishing I have ever known. We dodged the occasional squalls as best we could, abandoned ship whenever the winds got up, and in-between we caught three more wonderful trout. Each was big, beautifully-spotted and as ferocious as their name suggests. We returned them all to the water, grateful for the sport they had given us, and watched them jet in to the limestone depths. On the final morning Patrick and I snuck out for two more hours while Vic packed the bags. There were to be no last-minute ferox, but a solitary pike of twenty-pounds stole the moment. That capture summed up the Corrib for me – wild, beautiful, full of surprises. Just the sort of place old Negley would have loved. Twelve hours later, Vic and I boarded the ferry at Rosslare. The story was done, the book’s finale written, but I knew even then that our week was not an ending. It was the beginning of a deep love of the lough, its islands and its fish, and it will last as long as I do. Beneath the Black Water by Jon Berry is published by The History Press. This page was added on 29/05/2012.